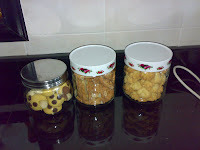 Thanks Pick Shan, Nancy and Daphne for the cookies you save my life. 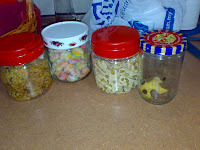 Every CNY it my job to provide the cookies for my Mom. But this year I was a bit busy with a fews things and also because I was leaving Formis so i didn't have chance to buy the cookies. My mom keep asking me where are the cookies and I always tell her coming soon. Wait wait. Lucky on Sat my frens bought cookies for me. The best part was it was homemade. Yummy Yummy. Thank you for saving my life and the yummy cookies. Only special visitor get to eat these. the rest eat those that I bought from outside. Nancy your cheese cake is very very nice. My cousins came over on Sunday they ate some and took the rest home. 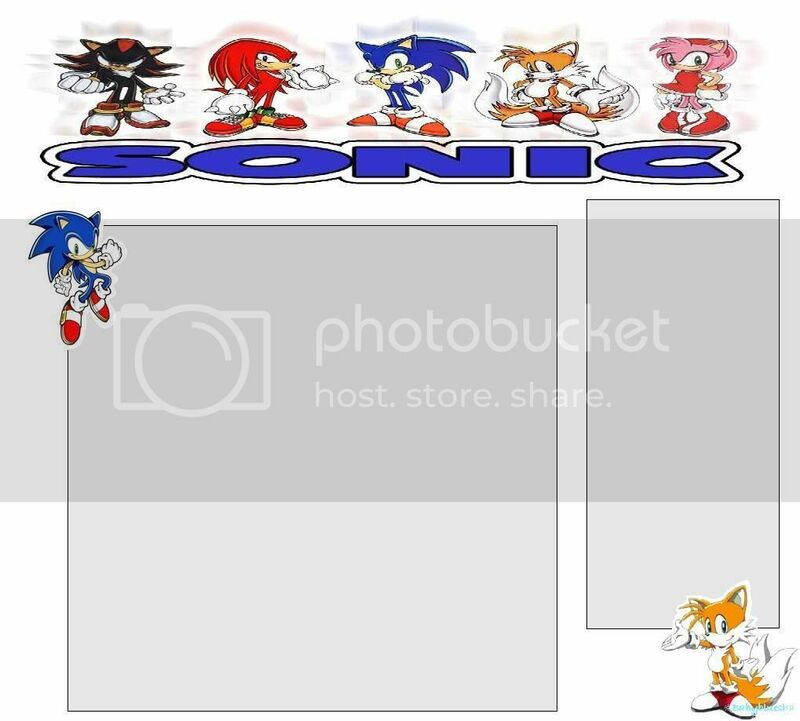 :-(. Lucky my mom save a piece. Poor Little Zach was sick on Friday when I came back from work. We brought him to the doctor and since he was not well. I thought I will just pop over to the 7-11 and get bread for him. Bought a loaf of Hi-Five bread. I didn't know that Miri dont have this type of bread. 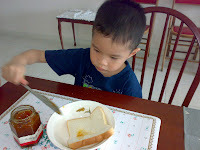 His Mom gave him a piece of bread together with Jam. 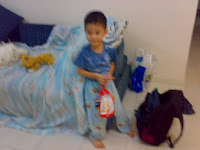 (hehe.. Lucky my cousin left her apple juice and jam at my place). The first piece he eat he was very exicitied. He tear it to smaller pieces was shitting at the sofa to eat. After he finish he said he want some more... so the mom brought him to the table and join us. 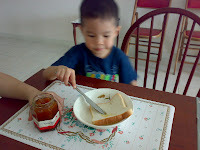 He then ask to spread the jam himself. He like the bread so much that he wanted to eat 3. But we told him cannot so made him share one with me. he keep looking at the loaf of bread make sure that we don't take it away from him. 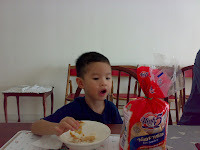 He ask me if he can hold the bread so I said OK.
After look what he did with the loaf of bread. He wanted to put it in his bag and take home. 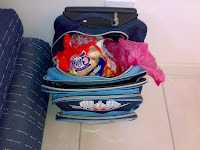 he actually told his Mom that he will take all the bread and leave Aunty Joyce with the plastic bag. 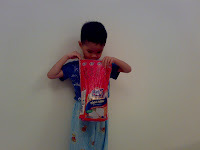 So next time anyone go visiting in Miri please bring Zach his bread.